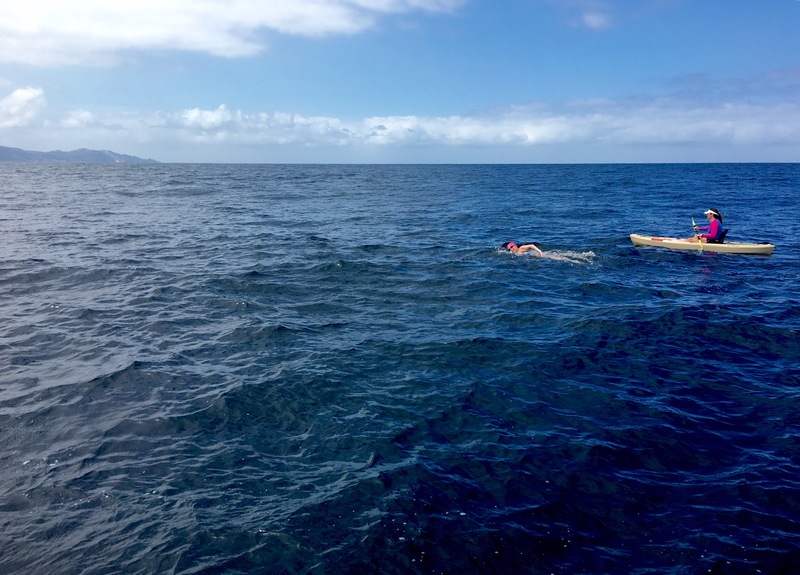 Swim & Tonic | Courtney Paulk's journeys in open water marathon swimming. English Channel 2x swim is on for tomorrow at 5:00 a.m. GMT (midnight Tuesday EDT)! If anything changes, I will post. Keep sending positive messages to Mother Nature for calm seas and winds. Swim on hold for now due to weather. Will update when I know something. I’m all set to start my 2x English Channel swim on Tuesday morning at 4:00 a.m. (or 11:00 p.m. Monday on the US East Coast) from Samphire Hoe. If anything changes, I will post an update. Here is the tracker link. Both of these swims were absolutely amazing. And, I couldn’t have accomplished them without the support of so many people. For my 40 Bridges swim in Manhattan – Matt and my friend Paul Rekoff were crew. For my first lap I had Terry Lopatosky as my kayaker and for my second lap I had John Humenik. I couldn’t have asked for better support on this swim! It took me 20 hours 15 minutes and 55 seconds to circle Manhattan twice. This swim was nice because there were 5 other amazing people swimming around with me. In the end, four of us completed the swim – me, Jaimie Monahan, Michele Walters and Gilles Chalandon (this picture was taken a few months after the swim). New York Open Water did a fabulous job getting us around the island twice through tricky currents and lots of boat traffic. Swimming around Manhattan in the dark is one of the coolest things I have ever done. For Catalina, I had Matt, Kris Rutford, Stephanie Hopson and Cheryl Siler on the crew. Pulling double-duty as crew and kayakers I had Amy Frick, Kristi Turner, Jamie Siler – and the head kayaker was Dan Simonelli. Truly an amazing team. It took me 33 hours and 13 minutes to get to Catalina and back. These folks got me through perhaps the most vulnerable point in my life. By the end of the swim, I was hallucinating pretty badly. I was seeing all sorts of things in Dan’s kayak during the last five hours – a walrus, a dog (named Chris), a boom lift. I also was seeing pebbles underneath of me as if was coming into shore – despite the fact that it was dark and we were miles from shore. And, I had a crazy notion that we were swimming in circles waiting for the woman that owned the land where we were going to finish to give us permission to land. Of course, the land we were aiming for is public – no need for permission. Once on board, I asked Amy to kill a bug that wasn’t there. The hallucinations passed slowly – turning into geometrical patterns on flat surfaces and after about 24 hours they were gone. I was so glad to get this swim done – in what were not really ideal conditions for a two-way. Also since 2016 – I’ve been to Ireland twice for Cork Distance Week (only for part of the week this year). And, I went to SCAR in Arizona in April of this year. Both events are amazing experiences and I would highly recommend both of them. Next week, Matt and I are headed to England for another big swim – a 2-way English Channel swim. My window is between August 18-25. I will be swimming with Eddie Spelling with the CS&PF. I will post the link to the tracker when I know for certain when I will be swimming. Teamwork makes the dream work. Kelly Cragle, one of the crew, came up with that as a hashtag during the swim. And, boy was that ever the case in the Catalina Channel last week. So, not a double, but a fantastic one-way all the same. I am incredibly pleased with my swim given the conditions. Going into the swim, I expected, if I didn’t complete the double, that I would wake up the next day beating myself up and wondering whether I could have, should have, etc. But, when I made the decision to call the swim (and it took me a while to make that decision) I knew it was the right decision. Deciding to call a swim is not done lightly and is perhaps one of the most difficult decisions I have ever had to make. But, when I hit Catalina Island, I was happy and in good spirits and I knew that stopping there was the right call. Open water marathon swimmers say that, while it may seem like an individual effort, it really is a team sport. That there is no “I” in solo. And, that couldn’t have been a more accurate description for this swim. Despite horrible conditions, the team got us across to Catalina. One of the crew members asked me after the swim what my “favorite” part of the swim was and I had a hard time answering that question at the time. As I have processed the swim over the last week, I’ve concluded that my favorite part of this swim was the teamwork. The ability of a team to pull together, face, and overcome, every obstacle that is thrown at it. That was my favorite part of this swim. We arrived at the dock around 8:00 p.m. on Saturday, September 3rd. We loaded up the boat and, while we had been anticipating going from mainland to Catalina and back – the boat captain confirmed that decision. Ultimately, and in hindsight, I expect it would have been better to have started by going the other way. But, Mother Nature is fickle and unpredictable. We motored to Terranea Beach and I jumped around 11:15 p.m. to swim to shore. The water was lovely – upper 60s and calm. I had been pretty nervous leading up to the swim. But, as soon as my toes hit the water the nerves subsided. I finally was in my happy place. I had written a reminder on my hand to “swim happy.” I was able to honor that mantra for the first hour or so – but, after that, the wheels fell off a bit. 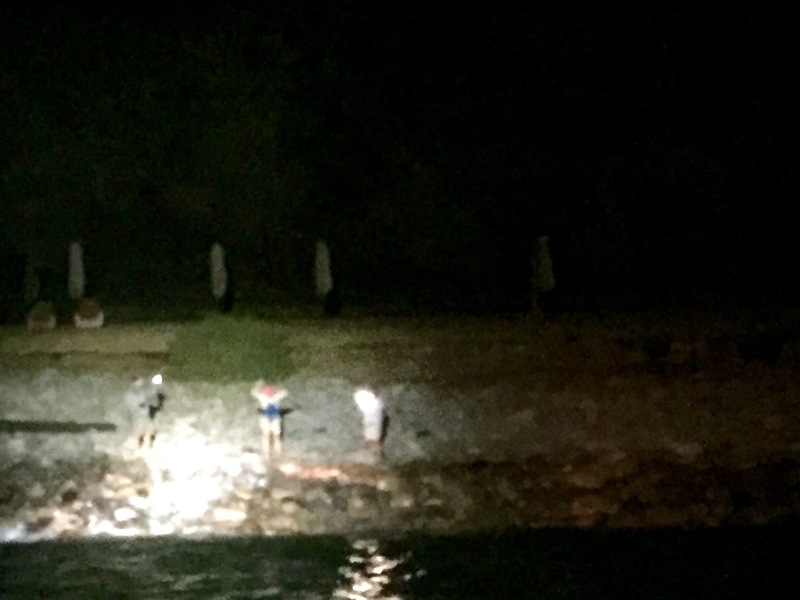 One of the biggest concerns I had about this swim was clearing the water at Terranea in the dark. It is incredibly rocky – big rocks, huge rocks, little rocks – but no sand, especially at high tide. A friend from high school, Jamie Siler, lives in California now and he and his wife, Cheryl, agreed to come to Terranea Beach to light my path into the shore. 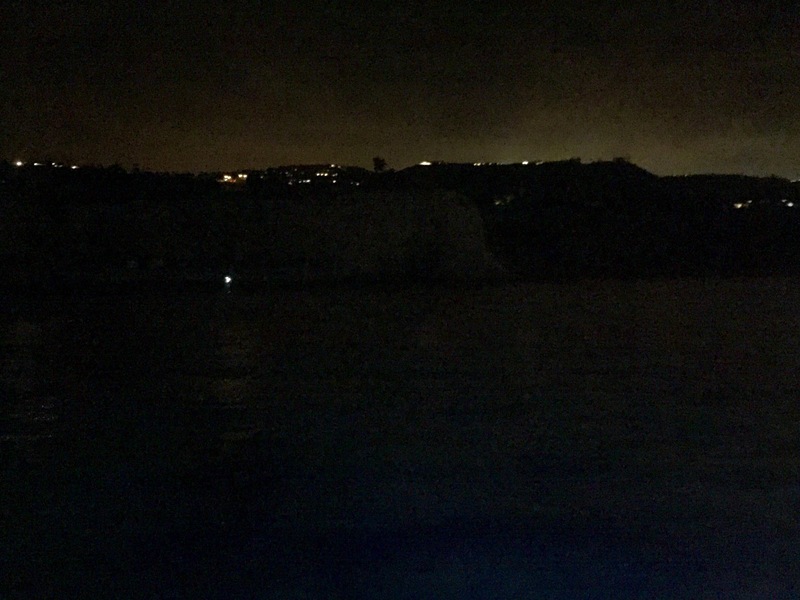 When the boat arrived just off Terranea, we could see the lights on shore shining brightly and that helped calm my nerves a bit. 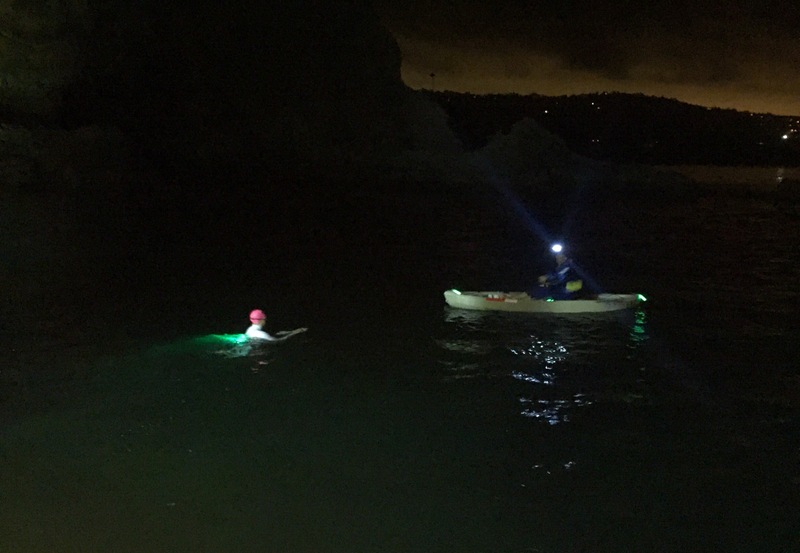 As I swam into shore, Jamie and Cheryl were shining the lights into the water and I could see the rocks clearly. I picked my path and they shifted the lights forward. The surge can be pretty strong there and the conditions going in were not ideal. I grabbed onto a few rocks to avoid getting pushed back out or pushed in too fast. I worked my way up to the shore gingerly through the rocks. I hadn’t seen Jamie since high school and I had never met Cheryl. As I was trying to clear the water – I looked up at Jamie and Cheryl and said “this is the dumbest &%#*(^%$^ thing I have ever done.” We had a good laugh. I finally cleared the water, said hi to Jamie and introduced myself to Cheryl. I got my bearings, had my picture taken, thanked them, put my arms up, brought them down when my toes touched the water and made my way back through the rocks again. They lit my path on the way out and, a few minutes later, I was on my way…off into the wild dark yonder around 11:25 p.m. I caught up with my kayaker, Julie, and we came around the side of the boat. The bioluminescence was now lighting my path in the water. It was a florescent green color and, just like my first Catalina swim, it was shooting off my fingertips like fireworks. It is amazingly beautiful. I started off with a pretty high stroke rate because I was a bit amped-up. About 10 minutes in, I caught myself and slowed it down. And, a few minutes later, the calm water started to turn a bit bumpy. I told myself, it must be the transition from inshore to offshore. But, over the next 15 minutes or so, the swell started to get increasingly larger. It was dark, of course, so I couldn’t tell exactly what was going on until my first feed. The crew used a blinking light to notify me that it was 5 minutes to feed and then again at 1 minute. When I stopped for my first feed, Julie said, “it is a little rough out here.” I took my feed quickly, looking back at the lights of Los Angeles, and headed on my way. The water in the Catalina Channel typically lays down at night. That is the reason one-way swims start at midnight – to take advantage of the calmer waters overnight before the winds pick-up in the afternoon. Between my first feed and my second feed, the swell continued to increase. I kept telling myself that it was nighttime and that it was bound to settle soon. By my second feed, I would estimate the swell was at least at 5-8 feet. When I stopped for my second feed, Julie said she was having a difficult time kayaking given the swell and was feeling a little sick. But, I turned again to look at the lights of Los Angeles, to get my bearings, did my feed and was on my way. Between feeds 2 and 3 the ocean started to heave. The swell increased to, at times, by my and the crew’s estimation, 10-12 feet. Julie got sick (literally) in the kayak and had to head back to the boat. So, there I was, out in the Catalina Channel, alone and in the dark, in what felt like massive swells, with only the bioluminescence and whatever else might have been out there to keep me company. I’m completely comfortable swimming next to a boat. I train mostly off of our boat without a kayaker – so the absence of a kayaker wasn’t that alarming. I also train in some pretty gnarly conditions – so the swells weren’t entirely concerning either. What was most concerning was that I really couldn’t see or anticipate what was coming. It was a relatively clear night and, when I stopped in the bottom of the swell, I could look up at the wall of water rising up in front of me – sometimes there was the “wish” of a white cap at the top, sometimes not. The swell was hitting me, for the most part, between my head and my right shoulder. Sometimes it was hitting me directly off my right shoulder. At one point, I was at the top of a swell and the boat was at the bottom and I could see over the top of the Outrider (a 50 foot fishing boat). That was the moment I realized that things were really not going according to plan. By my 3rd feed, the crew was having difficulty getting the line to me for my feeding. Frank Cragle, one of the crew members, had disappeared and I could only imagine he was puking off the side of the boat (ultimately, I learned that was, in fact, the case). I did my third feed and off I went. By my fourth feed I was starting to get really annoyed with the conditions – no longer really swimming happy. It was nighttime – WHY WASN’T IT LAYING DOWN!? I continued to try to think positively (reminding myself to swim happy) – telling myself it was bound to lay down soon. No such luck. It did not lay down and continued to bat me about like a cat playing with a bug. The crew continued to have trouble getting my feeds to me because of the conditions. I would be at the top of a swell and the feed would end up at the bottom of the swell. Or, the bottles would get caught in a white cap and pushed away. At times when the bottles did get close to me, they had broken open from getting tossed so forcefully. At one point, I went to take a feed and the bottle had filled with ocean water. Feeds were disappearing out of bottles. The crew would reel the bottles back in and try again. In hindsight, I should have suggested switching to once an hour feeds and taking on as much as I could every hour rather than feeding every 30 minutes. That would have minimized stoppage time for feeds and it would have limited the number of times they had to try to get the feeds to me. But, in the moment, as Matt and the crew described it, they were in survival mode, having difficulty standing to make and toss the feeds. Somewhere around my 5th or 6th feed I asked when the boat captain expected it was going to lay down and he said hopefully in a few more feeds. Unfortunately, no one can predict Mother Nature and the conditions remained unchanged. 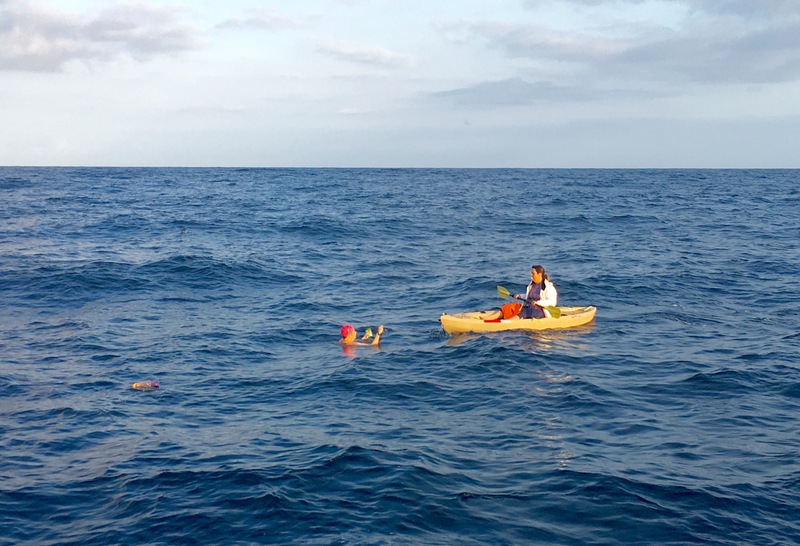 Around my 7h feed, another crew member, Amy Frick, got in to kayak because Julie was still feeling ill. Amy has kayaked a lot – but never at night and never in swells like we were experiencing. 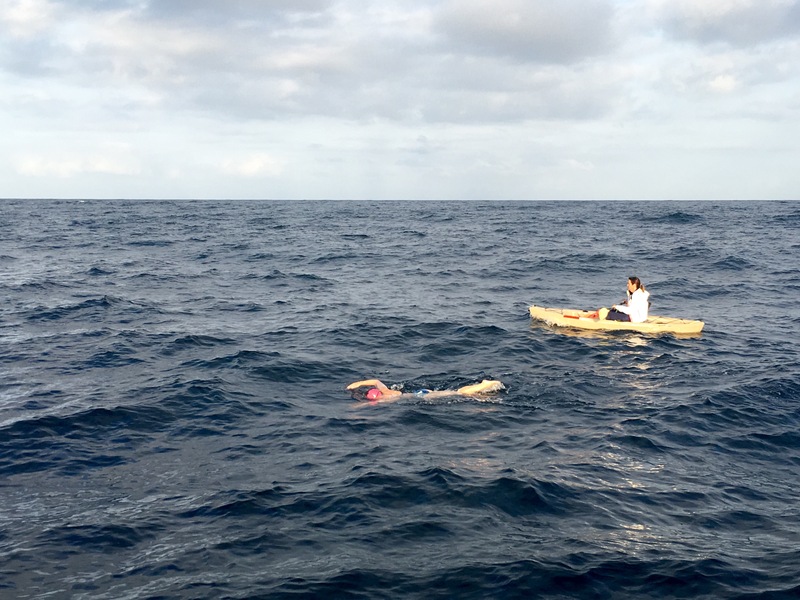 Amy crewed on my first Catalina Channel swim and on my Cape Cod Bay swim. We also swim together all the time and it was incredibly comforting when I turned back and saw her heading towards me in the kayak. Amy didn’t want me to be alone out there and the crew thought they could try to get me some nutrition off the side of the kayak a little easier. Amy and I battled the swell together for a bit. Up, and up, and then smashing down the other side. At times when I swam out of the swell I could actually breathe, face down, on the way down the backside of the swell. The crew from the boat and Amy from the kayak could see the top half of me swim out of the swell and fall about 5 feet on the other side. My right wrist started to hurt from getting snapped back in the swell and the white caps as I was coming through my recovery. Because I couldn’t see or anticipate what was coming, and because I was getting hit from the right, my right arm and wrist were taking a beating. I tried to windmill a bit to avoid the swell/chop but that only helped so much. Amy got out and I was alone again. A little while later, Julie got back in the kayak. When she was heading back out, she said she needed to go back for a minute because something she had in the kayak smelled like puke. At that point she told me she had puked in the kayak earlier. I thought she had just been feeling sick earlier and didn’t realize she had actually gotten sick in the kayak. My stomach, which was not feeling that great either, start to feel worse. And, frankly, I just wanted to throw-up myself. I typically feel better after I do and knew that it would help. But, it wasn’t coming easily so I continued to plow ahead. The swell continued and was still peaking at 10-12 feet by the time the sky started to lighten. At this point, I had been swimming in those conditions for about 7 hours. I had been feeling sick for nearly all of that time. I felt beat up physically and beat down mentally. Right after sunrise, a pod of dolphins graced us with their presence. The crew stopped me and I looked up to see a beautiful dolphin jump and clear the water just in front of the boat. I could hear their squeaks in the water as they passed just in front of me. It was just the boost I needed. It seemed like the swell was calming just a bit – down to maybe 5-8 feet again and I had some hope that the conditions were going to improve. Unfortunately, that hope lasted only briefly. The conditions remained at 5-8 feet throughout the morning hours – still hitting me between my head and my right shoulder. I finally was able to throw up and that made my stomach feel a bit better. But, and sorry to be gross, I realized when I threw up that I had not been getting enough nutrition throughout the night. There should have been more in my system. That was probably the first time I started to get concerned about completing the double. Overnight I had such difficulty feeding – I was concerned about the time it was taking me to even get to my feeds much less take them in and I think that caused me to short-change myself on the actual feeds. On top of that, my stomach felt pretty wretched overnight. The crew had trouble judging how much I had taken in because the bottles had been filling up with sea water or I had been just leaving the lid off after I fed. But, they knew that I was way behind in my intake – but, every option we tried didn’t seem to work. As the sun got higher in the sky, I started to take in more of my feeds and I started to feel better generally. But, my right wrist (not the one I broke by the way), started to hurt worse. I began swimming with a fist on that side to try to minimize the pain and to help stabilize it in the event I got hit with a white cap in my recovery. I didn’t actually mind that – but, of course, it isn’t very efficient. I also tried to windmill again on that side. But, the beating I took overnight was starting to catch up with me. The pain relievers weren’t touching my wrist and I knew that was also a pretty bad sign. I usually do a good job of not looking at the destination. And, frankly, I was having a hard time seeing Catalina at all because of the swell and chop. But, whenever I did get a glance, I could tell we weren’t moving very fast. I tried to put that out of my mind and just swim. During the late morning hours – as if right on cue – the wind started to pick up out of the south. Of course, that was direction I was headed. The swell got even more confused as the wind picked up and, within an hour I was dealing with a full block headwind and seas now hitting me strongly and primarily right on the top of the head. Julie, Amy and Allison all took turns in the kayak and each had a hard time staying with me because they were getting pushed backwards from the wind. At one point I could tell I was getting hungry and I needed some solid food. I hadn’t been able to get much solid food in because of the difficulties in getting feeds to me and I asked the crew if I should wait until the turnaround at Catalina to get some food. I felt like I had to be getting pretty close. But, both Amy and Matt said, quickly and emphatically, that I should go ahead and take some solid food in if I was hungry and not wait for the turnaround. Julie tried to get some solid food to me – but, because of the wind, we had a difficult time. And, at some point around that time, I threw my toys out of the pram and I screamed “I hate everything about this &%$^&(& swim.” And, at that moment, I really did. I had gotten beat up all night and all morning and now was facing a strong headwind. If I had been given one or even two of those conditions there is no doubt in my mind I could have completed a two-way. But, as Matt has said, not only did I not have favorable conditions – I had brutally unfavorable conditions for the entirety of the swim. A short while after my temper tantrum Amy and Kelly came out on to the deck. During my next feed, they blasted Demi Lovato – Confident – from the deck and did a little dance for me. It completely cracked me up and was just the boost I needed. As the early afternoon progressed, I could tell I was making terrible progress and I asked how far I had to go. I never ask that and Matt and I had discussed what to do if I did ask. He questioned if I really wanted to know and I was pretty emphatic about it. He checked with the captain and said I had three miles to go. I chuckled, in a surly kind of way and loudly enough that the crew heard. Then I asked how long I had been swimming and Frank said 14 hours. I chuckled again. Three miles to go in a headwind, with unfavorable and strong currents working against me. I put my head down and knew it was time to start processing what to do – continue on with the double attempt when I hit Catalina or call it a day. Amy was kayaking with me at this point and, during my feeds, I talked with her about what I was thinking. She encouraged me to wait to make a decision until we got a little closer to Catalina. Over the next two hours I thought about what it was going to take to get back to the mainland. I knew, as soon as I turned around, I would start to get a push as the headwind would then be a tailwind. But, it seemed that the current was coming mostly from the west and, while I couldn’t tell exactly, it felt like it was swirling a bit. So, I questioned how much the tailwind would really help given the current. Also, doing the math and assuming an approximate finish at Catalina in the late afternoon would mean, under typically conditions, the wind would start to subside which, of course, would limit any push I could get from a tailwind. I also remembered that the forecast was calling for atypical winds out of the northwest that evening. Not that conditions had been anything like the forecast. But, I began to envision a return trip where I didn’t get much help from a tailwind in the afternoon, I continued to battle a swirling current and the potential to face another headwind and swell in the final stretch back to the mainland. Primarily, I knew if I started the trip back, after what I had gone through, that I had at least another 6-8 hours in me – even after getting beat up. And, frankly, I was pretty pleased with that. But, I wasn’t sure I had another 15-20 hours in me. Forrest Nelson, the President of the Catalina Channel Swimming Federation, had told me that most doubles take about 20-25% longer on the return leg. Assuming those facts, with a 16 hour one-way, I was looking an approximate 20 hour return trip. I balanced that with the chance that I could get a pretty good push from the tailwind and the chop. I also heard the voice of Liz Fry in my head telling me that the trip back to the mainland would be “easy peasy.” I wanted, very badly to believe that. So, I processed and flip-flopped and questioned and did it all over again. But, ultimately, I decided that I had put up a pretty good fight, my right wrist was killing me and snapping/clicking at that point and I thought – I want to end my day happy with completing a brutal one-way and swimming longer (time-wise) by several hours than any of my prior swims, in the worst conditions that I have ever been in (by far) and that I could have ever imagined. Once I made that decision, and it was perhaps one of the hardest decisions I have ever had to make, I was completely okay with it. I was proud and happy of what I was able to accomplish and not sad about what I wasn’t. In the last meters closing in on Catalina, that is what I told myself. Tomorrow and weeks and months from now – remember what you did accomplish – because it was really, really hard – the hardest swim of my life. And, remember the limits to which you pushed yourself dealing with all of the crap conditions that were thrown at you. Remember and be proud of that. And, I am – so very proud of myself. Do I wish I had been able to complete a double – of course I do. But, I know what I did accomplish. The disappointment of not having completed a double can’t take away that feeling of accomplishment. So, next time, when I go back to try again – or when I decide to stand on any shore and look out and wonder what Mother Nature may try to throw at me on that day – I will do so with the knowledge and experience gained swimming from the mainland of California to Catalina Island in absolute crap conditions over the course of 16 hours, 23 minutes and 55 seconds. One of the proudest and happiest days of my life. As I turned to go into Doctor’s Cove, I popped my head up and told the boat that I was finished. Matt asked if I was sure. I said I was absolutely sure and that I was totally okay with it and I off I swam to finish my one-way. As I approached the shore in Catalina, there were snorkelers in Doctor’s Cove and a ton of folks on the beach. Amy kayaked ahead and explained to the snorkelers what I had done and that they couldn’t touch me. They moved to the side and, unlike 3 years ago, I got to swim through the kelp into Catalina in the daylight this time. It was absolutely beautiful – small fish, lots of kelp, amazing. I scrambled up on the rocks on the beach – very ungracefully – and put my arms up. Finished and happy. The information Amy provided to the snorkelers had apparently made it to shore and someone said “wait, what did she just do.” I turned around and said “I just swam from the mainland.” And, someone said “what mainland?” I said – “the California mainland – way over there – I left yesterday.” And, the people on the beach started to clap. It was hilarious. And, I felt exactly like I had hoped, happy and pleased with my one way. I clambered back down into the water and promptly sat down. Allison had swum to shore and reminded me to get a rock. I reached back and grabbed the first one I put my hand on, shoved it in my suit, and swam back to the boat, with Amy in the kayak and Allison by my side. I didn’t, and haven’t since then, questioned my decision to call it a day at Catalina. I don’t think I ever will. Thanks also to my kayaker, Julie Bertrand, the crew of the Outrider, the Catalina Channel Swimming Federation and the observers. And, of course to Jamie and Cheryl for lighting my way. To everyone who posted on Facebook and texted – thanks so much for your messages. It is such a huge boost to hear kind and encouraging words from friends. I can’t forget everyone who was along for the ride during my training. Special thanks to my lane mates, teammates and coaches at Peluso Open Water Masters, and everyone in Boston who trained with me at L Street and Nahant. And to Lela at Muscle Mechanix for keeping all my parts working. a huge impact on my life and SwimRVA, by giving children the opportunity to learn to swim, gives them the chance to change their own lives through aquatics. 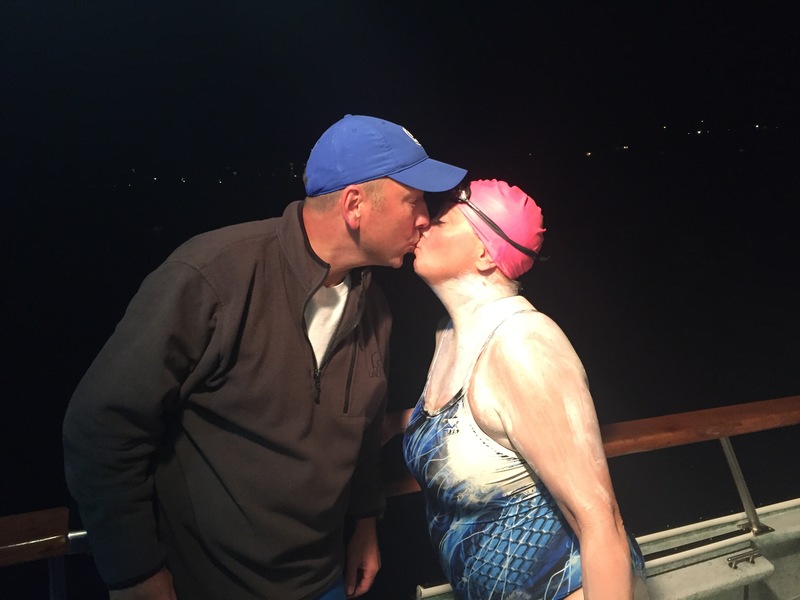 Shortly after ‪11:15pm‬ Saturday, September 3, 2016, Courtney gave Matt a kiss and jumped off the Outrider boat and into the Pacific Ocean. A small section of the rocky beach was illuminated by Jamie Siler, her friend whom she had not seen since high school! As per CCSF rules, she got totally out of the water, and after a brief reunion, she removed her water shoes and gingerly stepped back into the water. The clock had started and Courtney’s double Catalina Channel swim had commenced! Courtney swam strong throughout the night and morning. Despite the turbulent swells topped with whitecaps, she maintained a consistent stroke count and continued to make progress. She is currently just a few miles from Catalina. Once she hits ground, she has 10 minutes before she has to get back in the water. The plan is for Amy and Allison to swim behind her with her supplies, and give her essentials like sunscreen, Vaseline, and water while on Catalina. Then she will begin the second leg of her crossing.